Sorry if when you start reading this you are lulled into the false sense of security that this is Saturday, it isn’t unfortunately, I have just moved my bookish bits a day forward. This week we have some competition winners, some Persephone bits, big books and you have the opportunity to ask Granny Savidge Reads anything bookish and my mother too (who is just as hot on books) so rather than waffle on let’s get cracking. First up a HUGE thanks to all of you who came up with the wonderful descriptions of a Bunyip that author Evie Wyld and I asked for last Saturday, they are some of my favourite comments ever and I was thrilled how creative you got. Evie has had a look and named three winners who are Jenny, Fliss and Jodie! If you email me your addresses then a copy of Evie’s book will be in the post and your Bunyip’s will be on show next week as Joe is creating your visions right now. Now links and things this week are about bookish events both bloggish and in the flesh that are coming up. Not only is next Saturday the 8th the ‘UK Book Bloggers Meet’ which is being organised by the lovely Simon T (and I will be popping into briefly) it is also ‘Vintage Classics Day’ at Foyles where you can see and meet A.S. Byatt, Martin Amis, Adam Foulds, Julie Myerson… oh and me and my rather special plus one who will be reporting back on it all! So that’s something to head out for I feel, you can find out more about it here. From Monday it is also ‘Persephone Reading Week’ hosted by Verity of The B Files and Claire of Paperback Reader (who has done a wonderful Angela Carter month, I have been loving ‘The Bloody Chamber’ so much I have been rationing it). Do you have some Persephone’s lined up? I have five options I am mulling over currently. My being away leads to the final part of today’s post. I am off up north (or already on my way/there dependent on when you are reading this) to see my mother, step dad, siblings and THE WHOLE Savidge family, all 22 of us, which of course includes Granny Savidge Reads (who has told me her column is half done). Mum has agreed to do a Savidge Reads Grills like Gran did too. 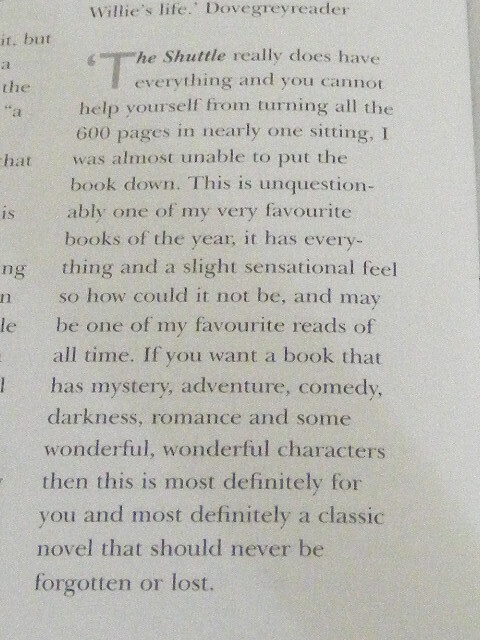 I then thought though I would go one further and let you ask either of them any bookish based question you like!!!! Just leave it in a comment and I will corner them sometime on Sunday and let you have the results in due course. 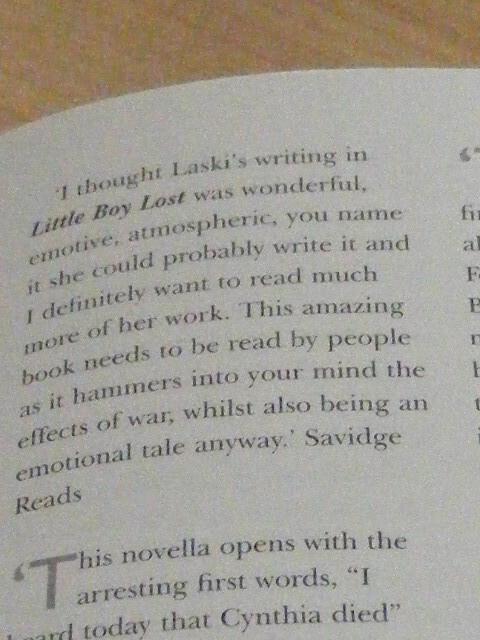 Hopefully there will be a post above this now which talks more about how the books come into Savidge Reads and my ethics behind it all. In fact some of you might have come from there, but enough of that rant and onto something joyful. Books, books, books! Yes its one of those posts with pictures of the books to have arrived of late at Savidge Reads. 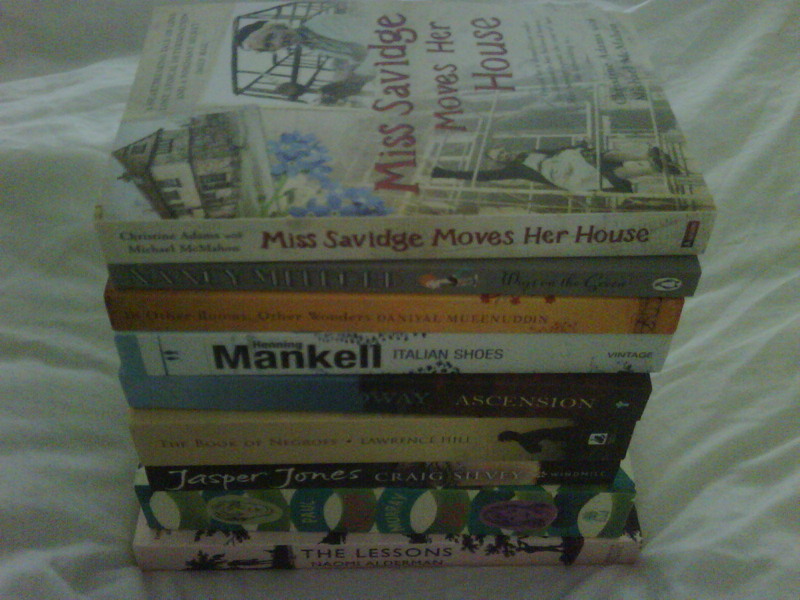 The first ones that I will share, though one isn’t a book really, are presents from some friends I saw at the weekend. 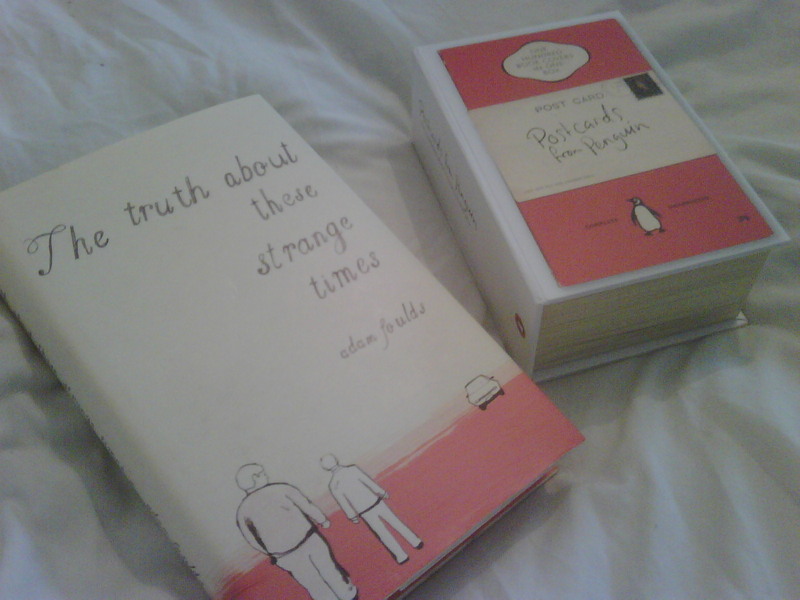 My lovely friend Dom got me ‘The Truth About These Strange Times’ by Adam Foulds “worried buying you a book would be a nightmare Simon, but I saw the line ‘he felt almost savagely awake’ and instantly thought of you’. I know nothing about this book so am quite excited. My friend Michelle got me a host of goodies including the ‘Postcards from Penguin’ I have had my beady eyes on for some time. Next up and some parcels from publishers which were in some cases birthday parcels and in other cases just random lovely parcels. I have separated them and below you can see ten of the long listed Orange books. I won’t list them all because I am well aware some people are already a bit Orange’d out already (I had a phase of that yesterday but am back to loving it all again) but it now looks like I will have no excuse not to read the short list or frankly the long list. No pressure though I might just see how I get on with one of them now and again. More of a mish mash of titles now for you which I would love your thoughts on, well I would love your thoughts on all of the books in today’s post but you know what I mean. There you have it. Have you read any of them, or indeed anything else by the authors? What are your thoughts on posts on incoming books? I love them on other people’s blogs but would love your thoughts; I might be in a minority. Mantel for Man Booker 2009? So today is the big day and we finally find out who is the winner of the Man Booker 2009. 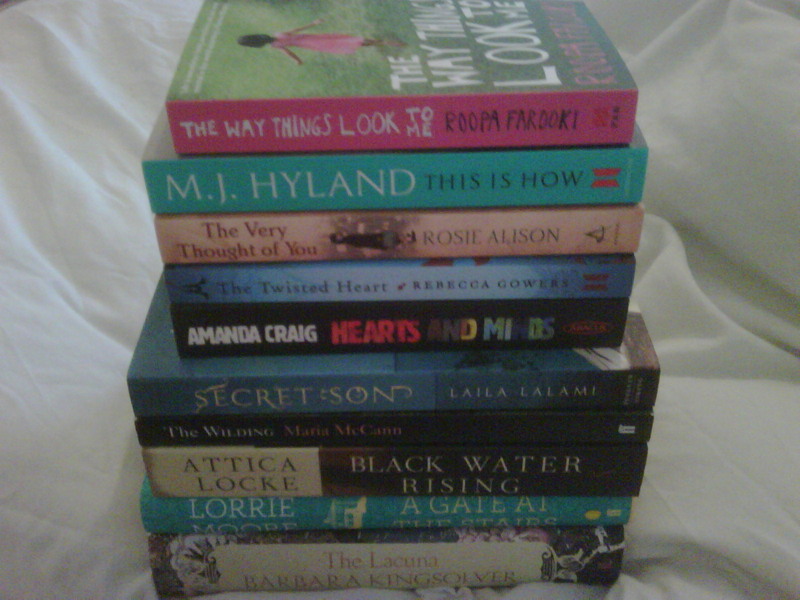 Its been quite a special year for me as its the first time I have read the entire longlist before the shortlist was announced. Last year I seemed to pick a longlist out of thin air and was pretty rubbish this year I was halfway there so maybe next year will be even better? I ahve to say I am split on whether I will do it next year. I have loved reading some new authors that I may not have heard of otherwise (Adam Foulds, James Lever, James Scudamore, Ed O’Loughlin) some authors I have been to scared to read until now for fear they would be too highbrow for me (J.M. Coetzee, A.S. Byatt, William Trevor) a favourite author (Sarah Waters) a fabulous debut again (Samantha Harvey) and some authors I now want to read the entire works of (Sarah Hall, Simon Mawer, Colm Toibin, Hilary Mantel) so it has been brilliant in many ways. There were a couple of con’s and that was the fact that it meant my reading became scheduled and slightly more pressured, and reading should be fun and occasionally it was a bit like wading in thick mud and I also worried that by reading that list I might be allienating readers in a way, plus with so many bloggers doing it were we saturating the book blogosphere? I would love your thoughts on it seriously, do you want to know all about the long list? Back to the task in hand though and to who I think will win. Well there were many joys in the Man Booker dozen this year and though my personal favourite ‘Brooklyn’ by Colm Toibin didn’t make it onto the shortlist it was one of my reading highlights so far this year. Another reading highlight for me and the book that I would love to see win has to be ‘Wolf Hall’ by Hilary Mantel. I don’t think I have ever loved a tudor based book this much, and believe me I have read quite a lot both in my blogging and pre-blogging days, its a favourite era for me in fiction and history. Who thought i would ever enjoy a book about Thomas Cromwell, I certainly didn’t and yet I was totally there along side him to the peak of his career. I will also be there on his downfall if the rumours are true and their is a second book in the wings (I do so hope so). There is one author that I wouldn’t mind Mantel loosing out to and that would be Simon Mawer as I though ‘The Glass Room’ was a very, very good book. I do have a feeling it may go Byatt or Waters way though, oh dear now it sounds like I am just covering my back. I want Mantel to win and thats that. ***Please note Simon has just noticed neither his Sarah Hall or Simon Mawer thoughts are up… this will be rectified very soon!! Anyone got any thoughts? I am mulling mine over. There have been some books that I have been really daunted by on the Man Booker Longlist and some that I have been really looking forward to. The Quickening Maze by Adam Foulds was one of the latter. It ticked quite a few boxes for me straight away, it was based on true events, it was set in a mental institution and on a superficial level it has a wonderful cover. It sounded like it was going to be a creepy account of a man’s journey into madness. Adam Foulds novel ‘The Quickening Maze’ is a novel based on factual events that happened in Epping Forest in the 1840’s. The book is set in High Beach Private Asylum where the poet John Clare is incarcerated. Well not incarcerated as he is allowed to wander the woods where he writes his poetry and dreams of his wives, yes wives. You see John Clare thinks that he is married to more than one woman though the depths of the why behind it is never really properly explained. It’s not just John Clare that we meet in the novel though of course. Through the novel we get to meet all of the other people either working at the asylum such as Dr Matthew Allen who owns the asylum and his family or those who are staying there, some of whom which we get to know rather too well in some circumstances like the man who is scared that his daily ablutions add evil into the world and so will not purge himself. I did find the patients and their varying different issues and how they were treated really fascinating and wanted to read a lot more about them. One of the latest arrivals to the asylum is the poet Alfred Tennyson who is there to support his brother who becomes a patient. Dr Allen’s daughter Hannah takes it upon herself to try and become the apple of his eye and so we are thrown in a strange kind of love story of sorts. I had no idea that these two world famous poets paths had crossed and so it was all again very interesting. Sadly though despite the premise being so me and the ideas and characters of the novel being so interesting it sadly just didn’t really quite work for me. The prose is beautiful, you can tell the author is a poet himself, and the journey of John Clare into the depths of madness is written incredibly well so in parts you feel you are going through it with him. The disjointed relationship between Hannah and Alfred and also her sisters and family just didn’t quite mesh with me. This could be due to the fact that I read it on a plane which is not the best reading spot for me; I don’t think that is quite the case though. I found that in what is actually a very short 258 page novel there seemed to be a few too many characters and ideas, if the story had just concentrated on the poets and the asylum it might have done slightly more for me. 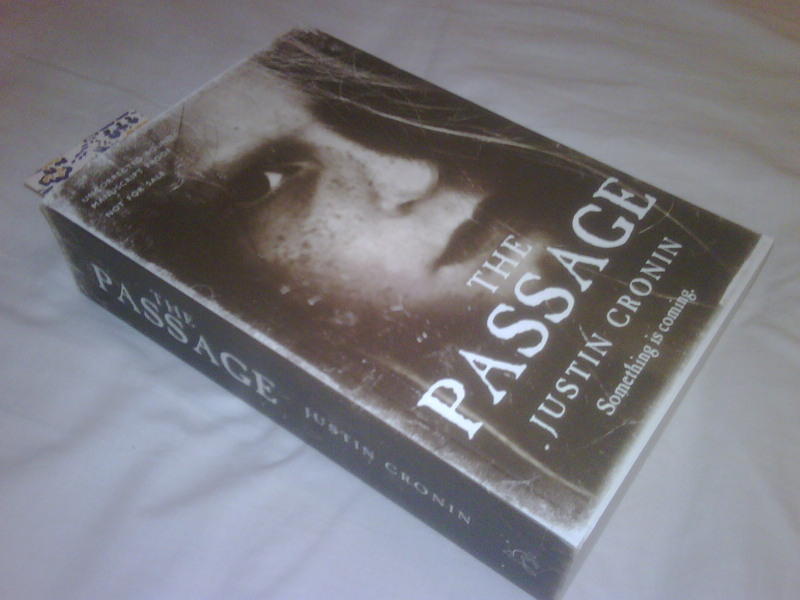 I feel bad not praising it as it’s very good, it just wasn’t the ‘me’ book that I had the high hopes it would be. Has that ever happened to any of you? A book you are looking forward to because it has all those magic ingredients that are just up your reading street and then it leads you into a dodgy dead end? 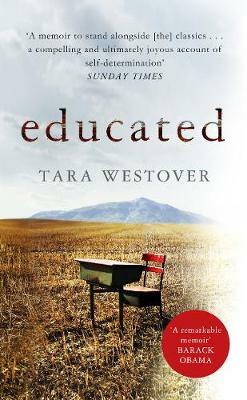 What novels have you read based on factual events have really worked for you, which ones haven’t? True Murder by Yaba Badoe – I got two copies of this the other day from the lovely people at Vintage and on planes, which I hate, I need something thats pure escapism, only this might be a little short for five hours each way. Lets hope two girls in a boarding school trying to solve a murder acn keep my mind off the journey in the air. The Haunted Hotel by Wilkie Collins – The first read of Sensational September which kicks off on the 9th after the Man Booker Shortlist is announced. Reading about a haunted hotel whilst I am staying in a hotel could be interesting. The one in the book is in Venice though. The Quickening Maze by Adam Foulds – A Man Booker Longlister and one set in an asylum which I think by blurn alone sounds the most ‘me’ of the man booker books this year we will see. The Mephisto Club by Tess Gerristen – I love, love, love The Gerristen, though I am worried I will soon have read all her works as The Converted One bought me ‘Keeping the Dead’ yesterday. This is the 6th in the series which deal with a lot of murders and “an old and secret society dedicated to the study of evil“. I am sure that this will easily keep me entertained on the beach or possibly on the plane. The Girl with the Dragon Tattoo by Steig Larsson – I have had this for ages and there has been lots and lots of great things said around this thriller. I havent looked at the blurb as I want to be suprised. I think this is likely to be the first of the reads, its nestled in my hand luggage waiting. Me Cheetah by James Lever – Or should that be by Cheetah? The oddest of the Man Booker Longlist that again seems to be perfect escapism. A mickey take memoir of Tarzans ape and a celebration (and good old gossip) of the golden era of Hollywood. So thats what I am taking. I mentioned a little competition and I have one. I would like you to try and guess how many books I will actually read (I am not including any travel guides) and which books they are. Whoever gets it right will get a book related gift from Tel Aviv’s Old Town (Jaffa) Market. I will find something special. I am leaving this blog up for two days, unless something bookish amd amazing catches my eye in the airport! Now all I have to try and do is keep away from the airport bookshops. Oh and just so you know am not being rude, I won’t have the internet while am away (which is strangely nice) I have timed some blogs to come over the week, so if I don’t comment am not being rude, and the same applies with visiting your blogs, I am sure will have lots of treats to catch up on when I am back. I have had quite an influx of books at Savidge Towers from some lovely publishers and thought I would share with you what titles you may well be seeing much more of on Savidge Reads. The first set of books that have been coming very kindly through the letter box are of course my main source of reading through August and that is the Man Booker Long List. Now if this wasnt enough I had two more deliveries (my Gran is staying and has been flabberghasted at the arrivals) one which isgoing to remain secret and be a theme for Septembers blogs and I will announce at the weekend and hope some of you will join in. The other wasn’t for me… or my Gran, but for ‘The Converted One’. The lovely people at Bloomsbury had sent two Brazilian authors works they are publishing this year, or have published sorry. ‘Equator’ by Miguel Sousa Tavares which ‘The Converted One’ is “going to read next, is so kind of them” and ‘Ashes of the Amazon’ by Milton Hatoum which won the Brazil Jabuti Prize for Best Novel in 2006. After enjoying Heliopolis (even though not by a Brazilian but set there) I am going to have to piler these myself! Which of these books have you been tempted to read or have your read? Have you read anything else by one of the authors? As ever do let me know, I love all your opinions. What books are at the top of your TBR and are you itching to start?